The Peanut Tree (aka. 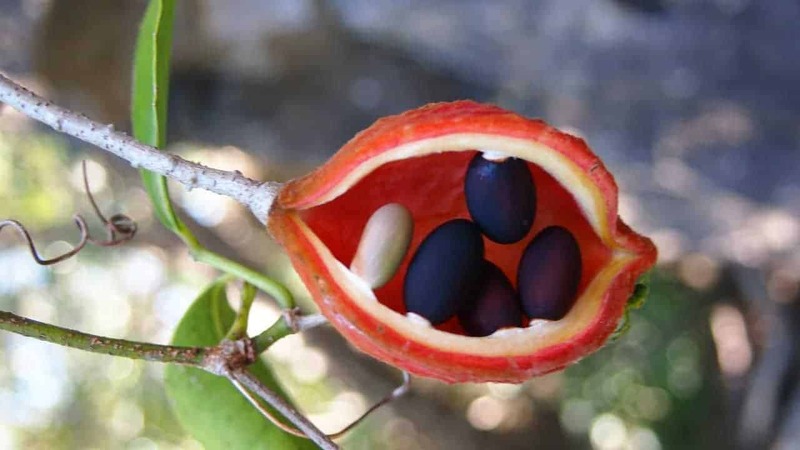 Dundil, Red-fruited Kurrajong) is a leafy rainforest species, in the same family as hibiscus and cacao, that produces edible black seeds resembling peanuts in taste. It can be found across the vine thickets and rainforest regions of northern Australia, Timor and Papua New Guinea. Attractive bright orange/red seed pods, when ripe, split open to reveal a few black oval seeds (nuts) that may be eaten raw or roasted once the paper-like skin is removed. Like peanuts, they make a great snack by themselves or as a sprinkle for ice cream, salads and other dishes. The leaves of the Peanut Tree aren’t edible, but were used by Aboriginals to treat wounds and stings. Its bark is also used in traditional fibrecraft. Clusters of small, fragrant, cream-white flowers appear in the Summer, followed by hard green seed pods, roughly 8 cm long. These pods are ready to harvest when they turn orange/red and are starting to split. Pick them straight off the tree before they fully open. The Peanut Tree does best in full sun and well-drained soil with plenty of water and mulch. It will tolerate poor sandy soil. This species grows quickly, producing light grey bark and dark green heart-shaped leaves in a spreading canopy. In cooler regions, you may notice leaf drop during the winter. Expect a healthy tree to grow 5-10 metres tall and 4 metres wide in the ground. With adequate pruning, it may be kept smaller in pots. Left to its own devices, it makes an excellent shade tree that attracts birds and pollinating insects. Will a Peanut Tree survive the winter? An established tree may tolerate light frosts, but younger saplings will be vulnerable. This tree prefers a sub-tropical or Mediterranean climate. If your area is susceptible to very cold winters, consider keeping your tree in a hothouse or movable pot when young. How often should I water my Peanut Tree? Younger trees should be watered as often as possible in the Summer, and mulched to prevent the soil from drying. But take care not to allow the soil to become waterlogged in winter. Does the Peanut Tree require pruning? Only to ensure a manageable size and shape. Frequent pruning is especially important if you grow your tree in a pot.